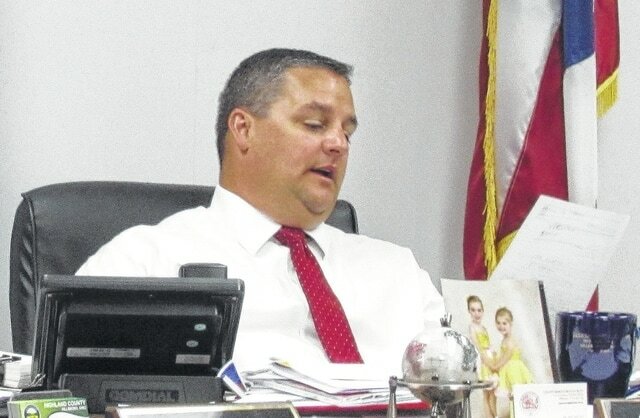 Highland County Commissioner Shane Wilkin is pictured Wednesday as he discusses the decision commissioners face over county employee insurance. Commissioners on Wednesday discussed the conundrum faced with insurance for county employees, a decision that will prove to be difficult, according to the commissioners. Commissioner Shane Wilkin said the county has an August deadline to renew with current insurance carrier, United Health Care, which is offering a 4 percent reduction in premium costs. But right now, Wilkin said, the doctors with Highland District Hospital are still in negations as to whether they will be in Untied Health Care’s network. If commissioners decide to renew with United Health Care, and HDH doctors aren’t able to come to an agreement with the carrier, that would mean that county employees would face a higher deductible for the out-of-network doctors, or would have to travel to a doctor that is within the network. He said that by staying with United Health Care, the deductible for seeing an out-of-network physician for an individual is $2,000, and it’s double that for a family. Highland County Auditor Bill Fawley clarified that HDH is in the United Health Care network, it is just the doctors that are in limbo currently. Wilkin said if commissioners “decide to shop” for insurance, the 4 percent premium reduction will no longer be on the table. But going with another carrier, Wilkin said, could mean a substantial increase in premiums. Wilkin said commissioners have a duty to taxpayers to make the best decision. “It’s a touchy issue,” he said, adding that whatever decision is made will affect everyone differently. And while Wilkin said it is prefered to keep business local, the county has pressing financial matters like the “very serious financial issue” of the cost of kids in foster care. As previously discussed by commissioners, the number of foster kids in the county far outnumber the available foster homes locally, so many kids in care have to be sent elsewhere, which costs the county more money. With time a concern, a decision will have to be made by next Wednesday’s meeting, because if it’s decided to look for another carrier, there has to be adequate time to go through the bid process. He said that if the county stays with United Health Care and the HDH doctors were unable to come to an agreement, the county would be able to give notice and change carriers mid contract. If it’s needed, commissioners said a special meeting will be called. In other business, bid openings were set for Wednesday morning for the Hi-Tech Center’s current facade to be replaced with metal, but no bids were received. Wilkin asked prosecutor Anneka Collins if, since no bids were received, whether commissioners can negotiate with companies for the needed face-lift on the building? She said they could. A bid opening was also set for the HVAC system at the building, but was cancelled as some specs within the bid were incorrect. It will have to be rebid. Fawley released the permissive sales tax received from April spending. A total of $570,716 was returned to the county. That money goes to the general fund and $3.2 million has been received so far this year.